An unborn boy’s lung is punctured by a bullet while still in the womb. A 2-year-old girl is shot in the head while playing at a restaurant. Three stray bullets cut down a 13-year-old during physical education class at school. Rio de Janeiro, which just a year ago was in the global spotlight as it hosted the Summer Olympics, has always struggled with crime. But amid a national economic crisis that has exacerbated deep problems of inequality, this city famous for both its glamorous beaches and its sprawling slums is experiencing a wave of violence that’s the worst in a decade. With an estimated average of 15 shootings a day involving police and heavily armed gangs that control large swaths of the city, hundreds of civilians have been killed or injured in the crossfire — and increasingly that includes children, many of whom have been felled this year by bullets intended for others. In July, the federal government deployed over 8,500 soldiers to try to stamp out crime in Rio’s roughest neighborhoods. But so far they have not been able to stem the bloodshed. Here are the stories of six children who died this year for no reason other than they were in the wrong place at the wrong time. As a police officer in Rio, where more than 100 of his colleagues have been killed this year, Felipe Fernandes always knew he was risking his life each day on the job. 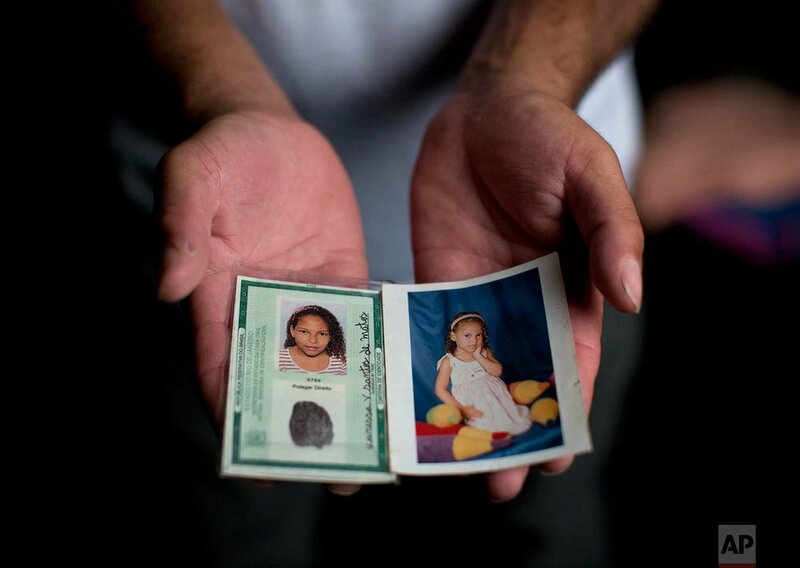 But he never imagined his 2-year-old daughter, Sofia Lara Braga, could become a casualty. As the family was dining early in the evening at a restaurant on the city’s north side, Sofia was romping in its play area. Suddenly a gunshot rang out from the street. “Everyone was coming down from the playground, but not her,” Fernandes said. He realized Sofia was motionless atop the jungle gym, and he ripped its protective netting to get to her. A stray bullet had hit the toddler in the head, killing her instantly. Investigators have yet to determine whether it came from a gun fired by criminals or by police, who were pursuing a stolen car when the shooting happened. Fernandes and his wife, Herica Braga, have since moved in hopes it will help them leave painful memories behind. But Braga is holding on to Sofia’s belongings. In their new home, a room dedicated to the girl has her dolls, teddy bears and clothes. “I live with the illusion that maybe one day my daughter might come back home,” Braga said, tears rolling down her cheeks. Classes at Fernanda Caparica’s school in the Mare slum were canceled that morning due to gunfire between rival gangs, something that is all too common in Rio. Thayana Caparica, 23, took her daughter home and ordered Fernanda, 7, and her two brothers not to leave the house. But by afternoon Fernanda had grown impatient and wanted to play outside. She kept insisting. Finally Caparica let her go to a friend’s house. Around 7 p.m. Caparica heard gunshots and immediately called the friend’s mother, who said the children were playing on the terrace. Moments later she learned that Fernanda had been shot in the face. The girl died at a hospital. Their hearts broken, Caparica and her sons also now live in constant fear of more shootings. The eldest boy is especially petrified. “Every time there is crossfire, he tells me, ‘Mom, I don’t want to die like my sister,’” Caparica said. Maria Eduarda Alves da Conceicao, 13, had wandered from her PE class on an outdoor basketball court over to the entrance of her school when she was hit by three bullets. They came from police officers who were after armed suspects nearby in the northern Rio slum of Acari. A police officer has been charged with involuntary manslaughter. The school is full of reminders of the curly-haired teen, who dreamed of becoming a basketball player or a flight attendant. On the outer wall, bullet holes have been painted over with red hearts. Maria’s smiling face is painted on a giant mural opposite the entrance. On the basketball court she is depicted with angel wings, taking a selfie. 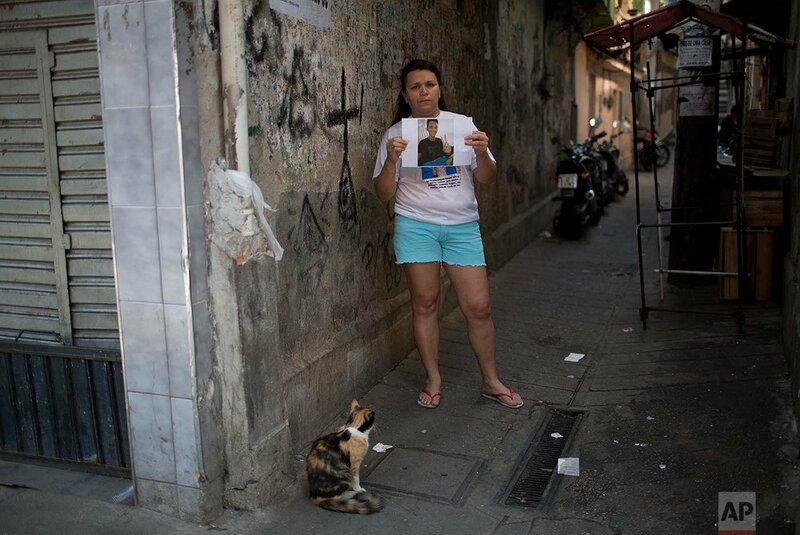 After her death Rio’s security chief promised to revise police protocols for operating near schools. The mayor promised to build bulletproof walls around public schools in dangerous areas. Neither change has yet to materialize. Every night before going to bed, Tereza Farias looks at cellphone pictures taken by bystanders who witnessed her son’s slender body lying in his own blood. Felipe Farias, 16, died in the Alemao slum complex while he was returning from a protest condemning the death of a 13-year-old who was also killed by gunfire. 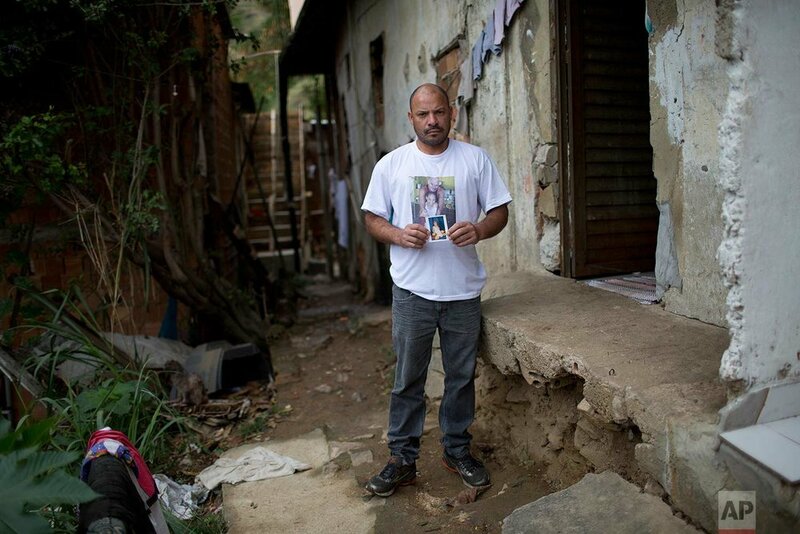 Felipe was the fourth person killed in Alemao just in that week. The wall of the narrow alley where it happened is still pockmarked with bullet holes the size of bottle caps. Several witnesses reported the fatal shot came from police. However, investigators have told Farias they will not go to the scene for fear of being attacked by gang members. “The investigator told me that if he came here it would be like signing his death sentence,” said Farias. Felipe had hoped to join the army when he turned 18, following in the footsteps of his two older brothers and his uncle. Claudineia dos Santos Melo, almost nine months pregnant, had just finished running errands at her local supermarket in a slum in the metro-area city of Duque de Caxias when she saw a police car racing in her direction. She sensed a shooting could break out at any moment. But before she could take cover, she was hit. “I immediately thought of him because my belly hurt a lot,” Melo said, referring to her unborn son, in an interview with Globo TV a few days later. Melo was taken to a hospital, where doctors performed a cesarean section to deliver the baby. The bullet had damaged his lungs and spine. Melo met the son she named Arthur for the first time a week later in the intensive care unit. After spinal surgery, Arthur appeared to be recovering. Doctors even called him a “miracle” baby. But he died of bleeding July 30, exactly a month after the shooting. At the funeral, the only sound was the clicking of journalists’ cameras as Arthur’s father silently carried the tiny white coffin. Police officers barged into the home of 10-year-old Vanessa dos Santos in the Lins slum complex, purportedly in search of a suspect. But the girl was the only one there. From next door, Vanessa’s neighbor and godmother shouted a warning for her to get out immediately. As Vanessa bent down to pick up her flip-flops, a high-caliber bullet struck her head. She died on the doorstep. To this day, police have yet to officially assign responsibility for the deadly gunshot. Like relatives of some other victims, Vanessa’s mother and two older brothers have moved because they were haunted by the holes left on the yellow walls of the living room. 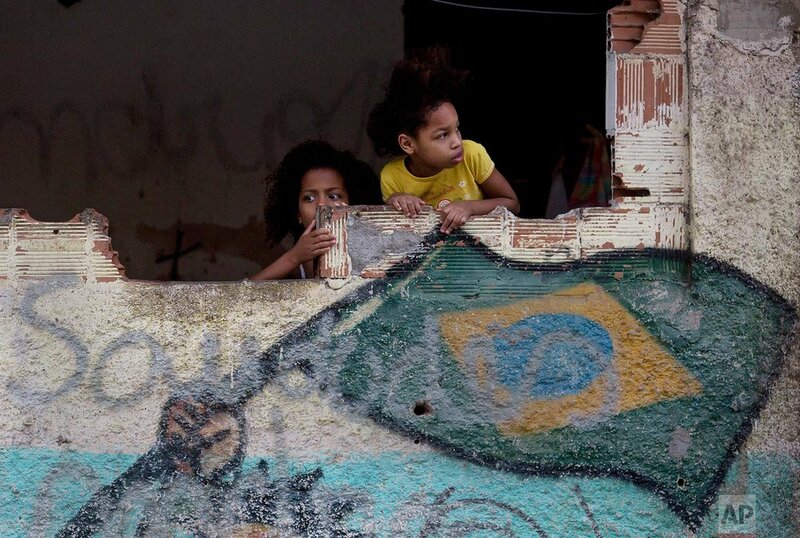 Text from the AP news story, Rio's kids are dying in the crossfire of a wave of violence, by Renata Brito.